DMV.com was created to help simplify your life by providing you with all the vehicle related information and Rhode Island DMV services you may need, in one place. Quickly find information and services regarding driving records, vehicle registration, drivers license renewal, license plate renewal, getting a learners permit, and finding a Rhode Island Department of Motor Vehicles approved traffic school. Learn how to get a drivers license in Rhode Island, renew a license and more. The DMV requires a drivers license for resident motorists. Ordering RI driving records online is a quick and easy process. 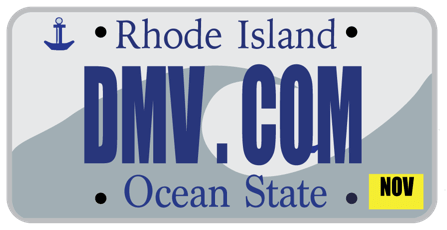 Request your Rhode Island driving record conveniently online from the DMV. The Rhode Island DMV requires drivers to have minimum car insurance. Find discount car insurance through our RI online car insurance center. Completing RI traffic school enables drivers to earn insurance discounts and other benefits. Learn more about RI defensive driving school. Taking a Rhode Island DMV practice test can help you get a license. Take an RI DMV practice exam to test your readiness for the driver exam. Learn about auto registration services in RI, from new registration to renewal. RI drivers must get car registration documents from the DMV. Rhode Island drivers education is required by the DMV for drivers permit applicants younger than 18. Learn about RI drivers ed requirements. An RI car bill of sale is an official receipt to obtain when you buy or sell a car. Learn how to get a bill of sale form at the RI DMV. Paying traffic tickets online in Rhode Island saves time. Learn how to start an RI traffic ticket defense or how to pay a speeding ticket. Getting a DUI in Rhode Island may result in jail time, fines and DMV penalties such as license suspension. Learn about RI DUI laws. Buy a car online in Rhode Island with help from our resources. Buying a car online in RI can simplify your DMV registration experience. You can obtain the Rhode Island DMV services you need at a nearby DMV office. Contact the Rhode Island DMV location closest to you today. Check out our easy-to-understand guides for drivers license, vehicle registration, license plate, emissions and other motor vehicle issues online. DMV.com saves you time and let you skip all the DMV’s bureaucracy. We’re the most helpful and easy-to-use guide to the Rhode Island Division of Motor Vehicles. DMV.com is a private company that is not associated with any government agency, and thus spares you a headache when it comes to government bureaucracy. We’re not only serving the most-up-to date info in the quickest possible way, but we are also eager to engage with you, all Rhode Island vehicle owners. Feel free to comment our pages, follow us on Facebook and with your interaction help us become even better in providing the latest dmv related info. In our wide range of articles you’ll find all answers related to renewing your drivers license/issuing an ID, registering your vehicle/renewing your registration as well as getting auto insurance rates and advice on how to avoid peak times at your local office. DMV.com is one of the most user-friendly sites you’ve ever come across. You only need to use the “search” feature or the navigation sections and you’ll find exactly what you are looking for about the Rhode Island BMV. Order a Copy of Your Driving Record Today! Simply the process of getting a copy of your driving record, by using our online service. You will receive the most up-to-date information in a shorter time frame. Your driving record will include your driver’s license status, violation convictions (including DUIs), endorsements, restrictions and administrative actions that are associated with your drivers license and reportable in your state according to their policies. Order a copy of your driving history today.